When I first started knitting on the passap I used techniques that I learned from working on the Brother machine. One of those techniques was binding off. The first time I went to do it I thought, “there are no gate pegs to bind off around, what do I do?”. I found an article that just said to pull all the needles out on the opposite bed and bind off around them. Okay, worked for me. But today I found much better bind offs by Barbara Scanlon. I like all three and they are much neater and very easy to do. I like the look also better than the latch tool. 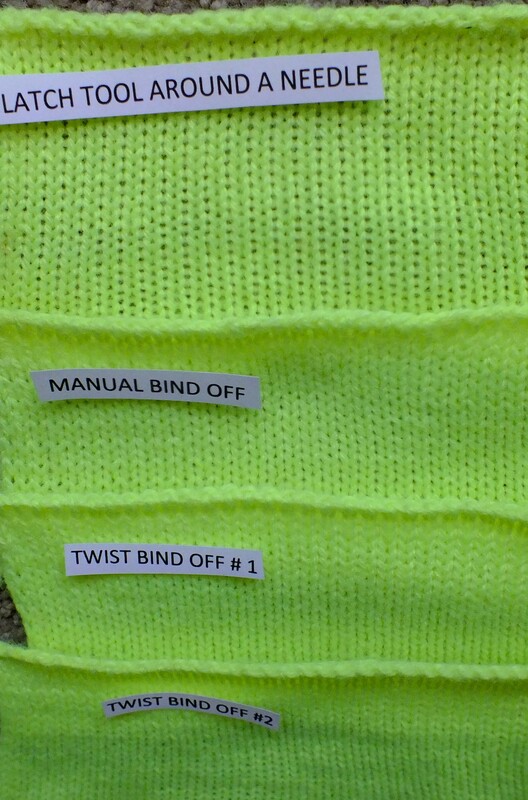 I have explained the bind offs and included pictures to help make it easy for you to understand. The first picture shows how I used to bind off around the needles from the opposite bed. You can see the circles of the stitches. I hope that you take twenty minutes to try these and save them in a notebook to refer back to. I believe these can be done on any machine that has a ribber. The manual bind off can be done without a ribber. Here are pictures and directions in my drop box.